At the core of all deliverables is the CEFEX certificate. It is provided in print format and is suitable for framing. The certificate can also be viewed online by clicking on the Advisory firm’s CEFEX Web-Mark. When the Registration Type e.g. 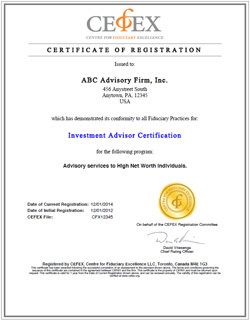 “Investment Advisor Certification” is clicked, the Standard is displayed, so the investor can quickly see the fiduciary practices addressed in the certification process. CEFEX provides the HTML code to imsplement this dynamic mark on the Advisory firm’s website. The current day’s date is shown, thereby validating the CEFEX registration. When the CEFEX Web-Mark is clicked, the Advisory firm’s CEFEX certificate is displayed in a pop-up window. A CEFEX Mark graphic is provided for use on the Advisor’s presentations, RFP responses, and powerpoint slides. A high resolution graphic can also be provided for letterhead, business cards, brochures and other printed material.